It is Christmas - that time of year when television broadcasters try to find the one thing that will get them the biggest ratings. The BBC has always been best at this. First it was Morecambe and Wise, then it was Only Fools and Horses, and now it is another double act, between one man and his anthropomorphic dog. Wallace and Gromit could be argued to be the modern day Eric and Ernie. They are the best in British animation and indeed film. After The Curse of the Were-Rabbit (2005), creator, director and co-writer of the series Nick Park decided to return to its original half-hour format. The result has been this wonderful feature - the fourth short film in the series following on from A Grand Day Out (1989), The Wrong Trousers (1993) and A Close Shave (1995). This time, the eccentric Lancashire inventor and his long-suffering canine companion have started their own bakery business: Top Bun. Their house has been fully converted to cover everything bread based, even going as far as having a windmill in the house (which must annoy everyone else living near 62 West Wallaby Street). Wallace currently runs one of the most profitable bakeries in town, but that is mainly because 12 other local bakers have been murdered by a serial killer (or should that be "Cereal killer"). Soon, he becomes distracted when he saves the life of Piella Bakewell, former star of the Bake-O-Lite bread adverts. Eventually the two fall in love, although Gromit has his suspicions, partly due to the behaviour of Piella's nervous pet poodle Fluffles. The film has all of the usual cultural references, everything from "Puppy Love" by Little Doggy Osmond, albums by McFlea, posters of Citizen Canine, Bagpuss in a rubbish bin, an advert for Cheesy Jet and an homage to THAT scene from Ghost. For me, the best moments in the film are the visual gags. Everything from a shed full of knifes labelled "WMD", to a book called Electronic Surveillance for Dogs by B. A. Lert, to even a forklift truck with oven mittens. 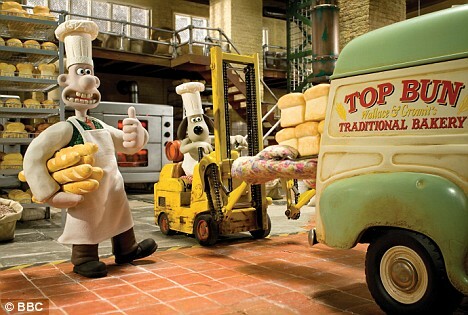 A Matter of Loaf and Death is absolutely wonderful - as is everything that Wallace and Gromit have been in. However, this film is of great importance to us Brits because it is the first adventure since the feature film. As a result, this is more British. It is slightly cheekier (how else can you do gags about people falling in love with dough rising) and full of gags that only we British would get. My personal favourite moment involved a sign reading "Yorkshire Border - Keep Out!" It also turns out that I am not the only person to have liked it. Over half of the entire British viewing public saw the film. It its peak, 58.1% of viewers saw it, or 15.88 million people. It was the most watched television programme on the whole of Christmas Day... and rightly so too. I will be hoping it will be up for a Ursa Major Award. A Matter of Loaf and Death is produced by Aardman Animations, and is to be released on DVD for Region 2 on 30 March 2009. The novelisation and a joke book based on the film are available with a special cook book going on sale on 2 March.